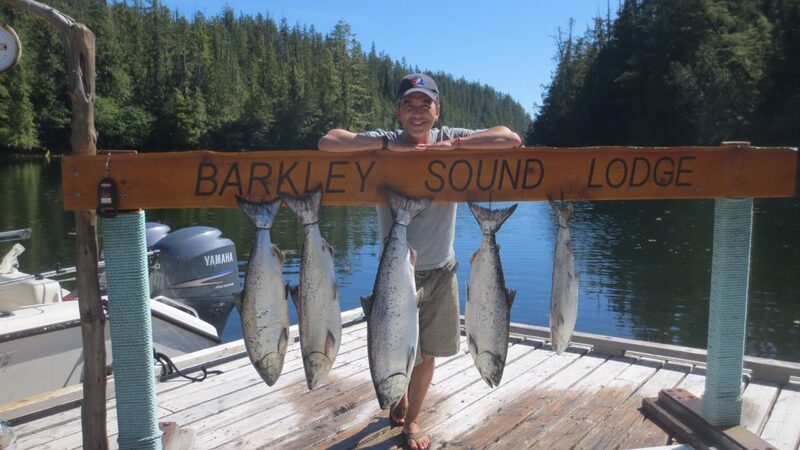 Darcy from Toronto with a fourteen pound Chinook landed at Cree Island in Barkley Sound. This fish hit a three and a half inch Irish Cream Spoon. August it often seems that the peak of the season is in the month of July. 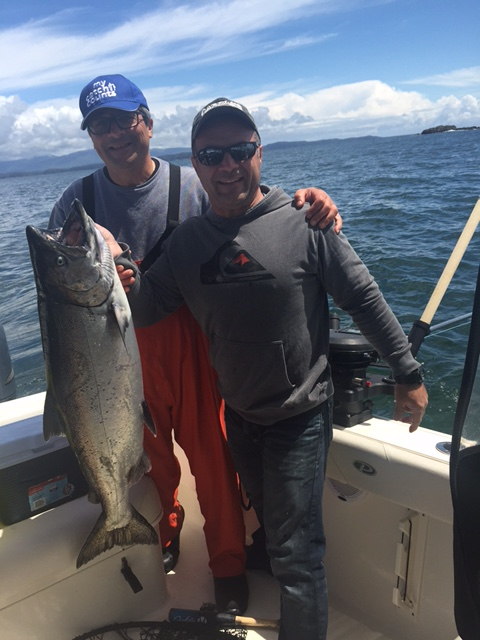 This is not to say that Chinook sport fishing does not continue in August and September. Coho which were often referred to as the number one sport salmon along coastal fishing locations in B.C. are a major highlight in late August through September. This thought is something to consider when thinking about and organizing sport salmon fishing this summer. 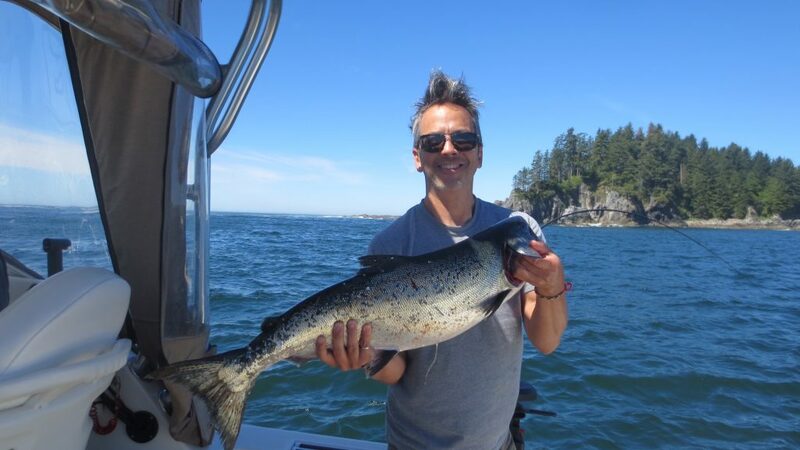 The Ucluelet fishing has been consistent over the past few weeks with some good fishing out at the inner and outer Lighthouse Bank and also Long Beach. 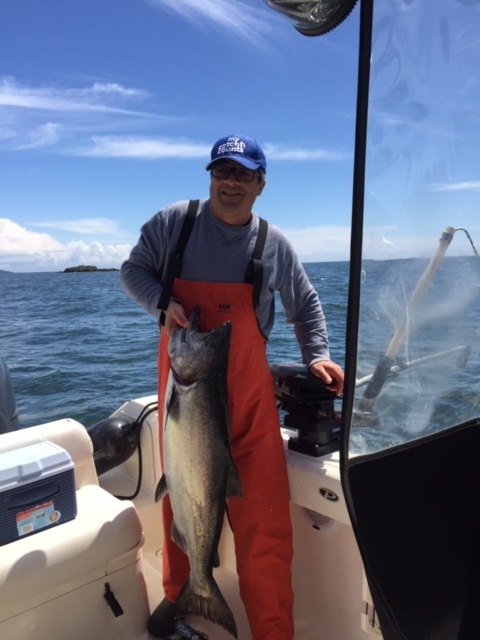 Mara Rock, Great Bear, Sail Rock, and The Lighthouse which are all very close to the Ucluelet Harbor have been choice selections for sport fishing on those days where the weather has not co-operated for boats to get out a little offshore.. The largest salmon have been averaging twelve to eighteen pounds. The fish out at the inner and banks have been close to the bottom between 130 and 160 feet. Guides have done extremely well on salmon and halibut with the largest hali for guests at forty-five pounds. The best lures to date have been anchovy and a few different spoons in the three and a half inch size. Green nickel, Irish Cream and Cookies and Cream have been working well. Other guides and sport anglers have had great success using needle fish hootchies behind a flasher. The needle fish will hide in the sand and on tide changes will come up to higher levels which creates a very good salmon and halibut bite. If trolling and using anchovy it seems that a green or red glow hotspot flasher with a green or army truck Rhys Davis teaser anchovy head with six feet of leader are working well. One important thing to remember is that during the season the food sources often get bigger and when using spoons and plugs the sizes should increase as the bait increases. The 2016 sport salmon fishing season in Port Alberni and the West Coast is shaping up just as has been forecast—-TERRIFIC!!!! There should not be disappointments this summer. Of course there are highs and lows but the high days will definitely out do any lows.